Benjamin Francis challenges believers to think about where we stand (or sit) on sharing our faith. Are we moving forwards in our journey of faith? Or are we sitting comfortably? Benjamin Francis sits down in the last of a line of four chairs. “But even this is not the destination,” he says. “This is a journey”. Ben is a BMS World Mission Team Leader, working in India at the forefront of discipleship-making movements whose highest purpose is seeing people come to know and love Jesus. He’s using the chairs as a metaphor, each one a place where a person might stop and sit on their journey of faith. It’s a compelling picture that asks Christians to consider where they’re at on their walk with God. 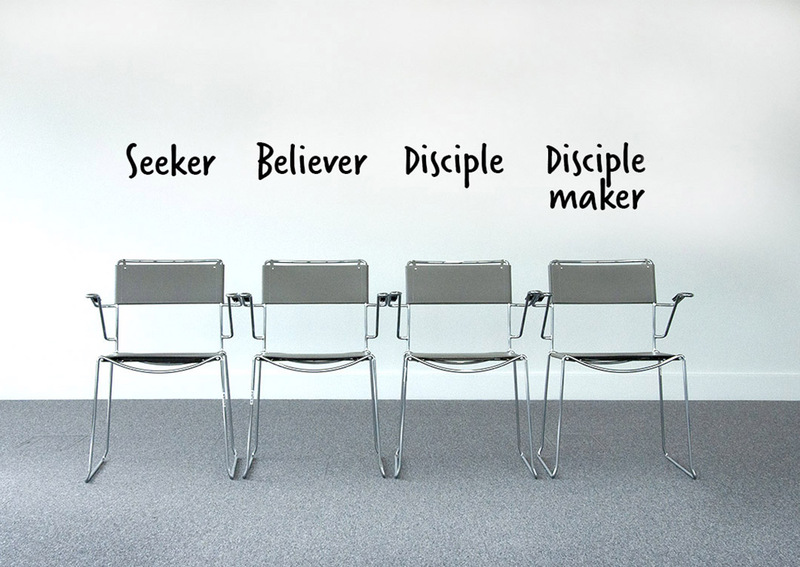 The four chairs stand for ‘seeker’, ‘believer’, ‘disciple’ and ‘disciple maker’. The chairs aren’t destinations, Ben emphasises, but stops on a journey that the people in your local church congregation are all on. Ben is passionate about discipleship-making, and he holds the Great Commission close in his heart – “Therefore go and make disciples of all nations” (Matt 28: 19). Ben believes this command of Jesus worked out in our lives will mean everyone developing in Christlikeness as they move along their Christian journey, from ‘seeker’ to ‘believer’, to ‘disciple’ and ‘disciple maker’. The four chairs stand for ‘seeker’, ‘believer’, ‘disciple’ and ‘disciple maker’. Which chair are you sitting in? To many across the world, this is the destination of a Christian. But that is so wrong. It’s challenging to see Ben sitting in the final chair, saying that even this isn’t the end of the journey. Even more so, when he explains that many Christians are sitting in the second chair, the ‘believer’ chair. “To many across the world, this is the destination of a Christian,” Ben laments. “But that is so wrong”. Ben’s vision for the Church is one of constant movement, growth and development. He wants to challenge us not to carry on just sitting comfortably in the chairs we’re in. Which chair are you sitting in? And where do your friends and neighbours in church sit? Watch Ben’s explanation of the journey of a believer in four simple steps, then share it with Christians around you. Get them excited about sharing the good news of Jesus, discipleship-making and growing in Christlikeness. And be encouraged! As a BMS supporter, you are enabling this message to go out into all the world, where disciples are being made right now thanks to your giving and prayer. Ben and his team are making disciples who are making disciples, in the power of the Holy Spirit and the light of the gospel. It’s so exciting that we can be a part of it. Thank you for your generosity and commitment to God’s work in the world. Thank you for supporting BMS. Download the video and share with your church!